Hello lovely ladies and Happy Friday! It’s been so hot outside this week and it feels as if summer has arrived, which makes me soo happy! With the hot summer days approaching, however, our skin will be in display a lot more, so of course we want it to look at its best, don’t we?! 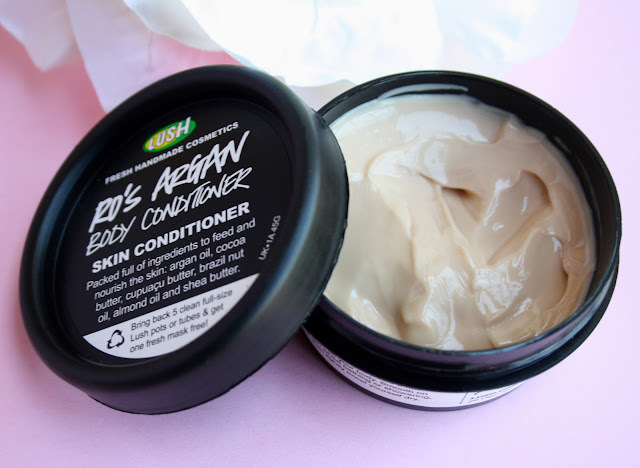 :) Having said that, today I decided to share with you my absolute favorite body product that’s made my skin divine – Lush Ro’s Argan Body Conditioner! Ever wanted the amazing soft and silky feeling that the hair conditioners give to your hair but on your body? Well, now that’s possible with this genius creation from Lush! 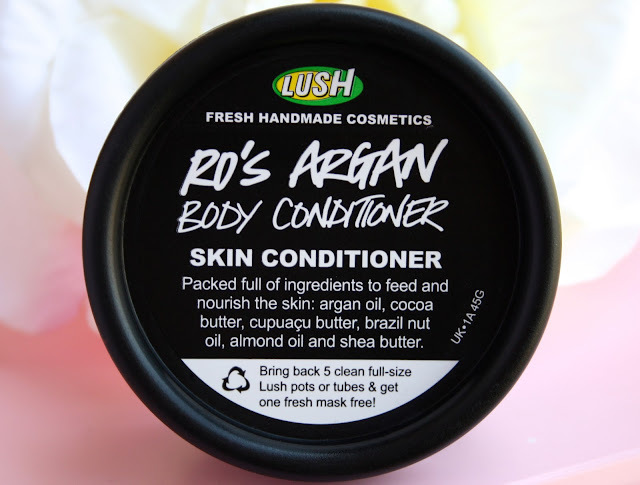 Ro’s Argan basically is a body conditioner, which is supposed to feed and nourish your skin while leaving it feel and look moisturized and super soft! To be honest, I was quite skeptical about this working but I got a little container of it in one if the Lush’s Christmas box sets and I decided to give it a go! Let me just tell you that it was love of first use haha! This little miracle worker made my skin ridiculously soft and smooth and it felt so moisturized, I couldn’t believe it! 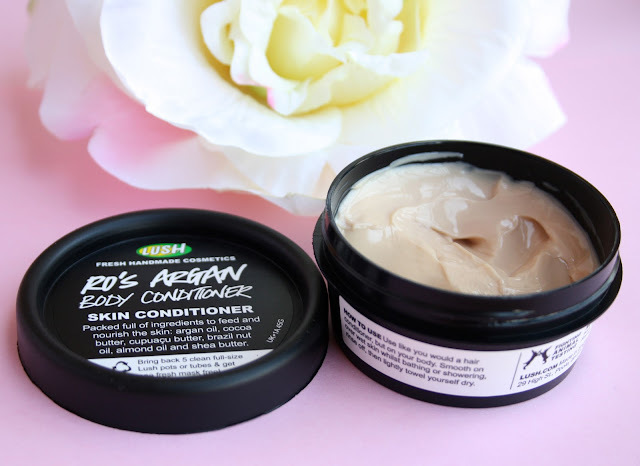 <3 As I’ve mentioned before I have really dry skin so I definitely need some help in the moisturizing department and Ro’s Argan definitely came to the recue! (: My boyfriend even noticed the amazing difference in my skin, which is rare, trust me haha! At first I was a bit confused about how am I supposed to use this body conditioner because I had never tried anything like that before! Basically what I do now is firstly I exfoliate my entire body, and then wash it with my favorite body wash. After that I smooth on a little bit of Ro’s Argan all over my body and let it sit for about 3 minutes. Then just rinse it off and towel dry myself! :) The feeling this body softer gives to my skin is so luxurious and incredible and I can’t really compare it to any other body product that I’ve used! Also, with this conditioner a little goes a long way so you don’t need to use tons of it! great review! the body conditioner sounds amazing! A woman at lush did a demo on my arm, and I really loved the results. I totally forgot about this product until now, thanks for reminding me I need to go pick this up! I also need to stock up on my tea tree water toner and dream cream. Love that stuff! It sounds so strange and unique!! Gotta love a bit of LUSH! I dont like the smell of this in the container, it's very strong but once I wash it off my skin smells yummy! I have super dry skin so thanks for this review! May ask if I can sample! My skin is always really dry and it's so hard to find a moisturiser which actually works! I will definitely have to try some of this! This is on my Lush "wishlist". I sampled it the other day and the sales associate let me in on a trick. The lotion is way too heavy to use alone out of the shower but if you mix it with unscented lotion then you can use it out of the shower, too! This by far is my favourite Lush product, every time I walk past I'm attracted in by something. Lush is just too addictive! Its going into winter here and this sounds like the perfect moisturizing cream. Would love to try it. sounds amazing! a tad pricey though.. will put it on the wish list for an indulgent day.. This weather is making my skin all dry, so this is perfect. And it smells like roses? Eh, I'm not a fan of the rose scent either, but if you like it that much, I might have to give it a try now! Thanks for sharing! I tried it in store and immediately loved it, but sadly I just couldn't make myself buy it because of the price tag! I think I will go back and pick it up soon, though. Thanks for the review! 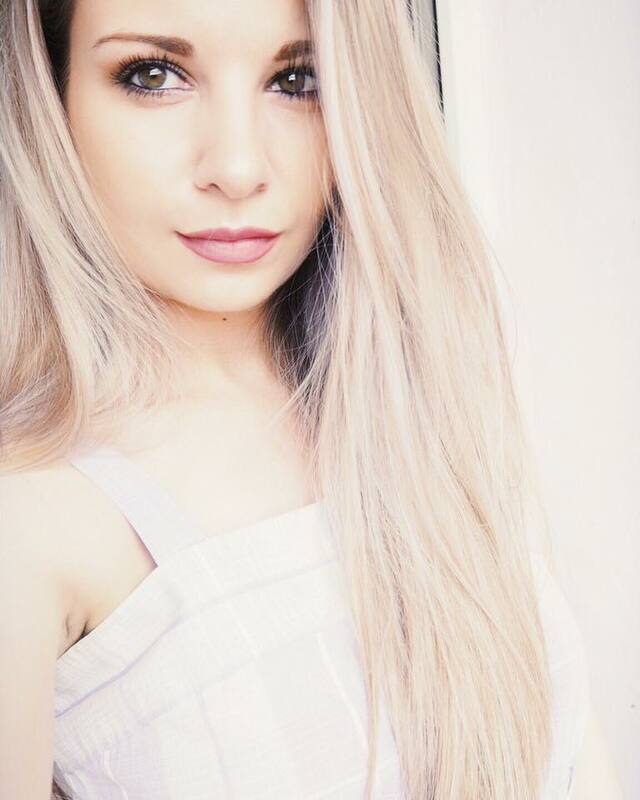 your blog is very great and give much informations, I love it! Your blog is so much fun I would love if you looked at mine! I absolutely love Lushproducts! Perfect for pamper nights!! Great post! really want to give this a go, loving moisturisers right now, nearly time to get my skin out! check out my Body Shop offer, just posted! I love your blog! maybe we could follow eachother? let me know! Great review, need to try this one soon! this looks like it should be on my summer must have!!! Especially since everyone shows skin in summer!! lol thanks for sharing!! I just started following and I love your blog! I'm glad I clicked on this post too since my skin is also on the dry side and I have been really looking for something to keep it soft and moisturized. awesome-sauce. Great post! I have this too and I love it! I just have a question for you though- how much do you use? When I put it on in the store, it felt so amazing, yet when I went home, it seems to have all soaked in in just a couple hours and i feel like i need to put lotion on. I am using about 4 quarter size worth per leg. How much do you use?